Fish Burrito night is our day-off, super colortastic tasty indulgence night that we enjoy 1-2 times a month. The best part is that there are always leftovers and extra tortillas so that we eat burritos and quesadillas the few days after. I made this quesadilla one fateful night when our leftovers where on their last legs. All we had was tortillas, cheese and sour cream. Raw onions and garlic are a staple in my kitchen, and I just happened to have a beautiful poblano pepper that I picked from my garden. 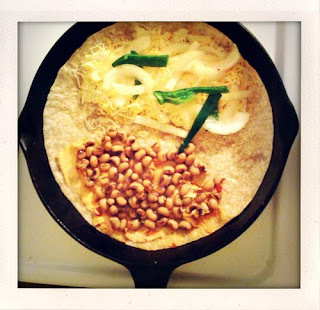 The night before, my boyfriend had eaten all of the black beans we cooked up in a quesadilla epiphany of his own. He told me about his successful experiment of adding a smear of spicy hummus on the inside of his quesadilla and stated that it was delicious. I searched the cupboards for another can of black or pinto beans, but only found a can of black-eyed peas. Haha! Two new flavor possibility and lots of protein! Heat olive oil in pan on med-high heat. Saute onions and poblano peppers for 5 minutes. Add garlic and saute for another 5 minutes. While sauteing, smear hummus on half of the tortilla and sprinkle cheese on the other half. Take the beans and mix in a bowl with the cajun seasoning, coriander, chili powder, salt and pepper. Spread the beans out on the hummus side of the tortilla. Remove the peppers, onions and garlic from the pan and place on top of the cheese. Add butter to the skillet and turn down to medium heat. Place tortilla in skillet once butter has melted. Cook open-face for 5-10 minutes until cheese is melted. Fold tortilla and cook on each side for another 5 minutes. Remove from pan and slice into triangles. Serve with sour cream and hot sauce. I will post the Fish Burrito recipe and pictures the next time we make it! oh yum, that looks like a great quesadilla!